Are you ready to buy a frying pan for your induction cooktop? There are a lot of factors to consider before you do. 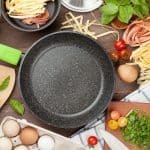 We put together this list of what we think are the top induction frying pans based on product specifications, customer reviews and in some cases, our personal experience. 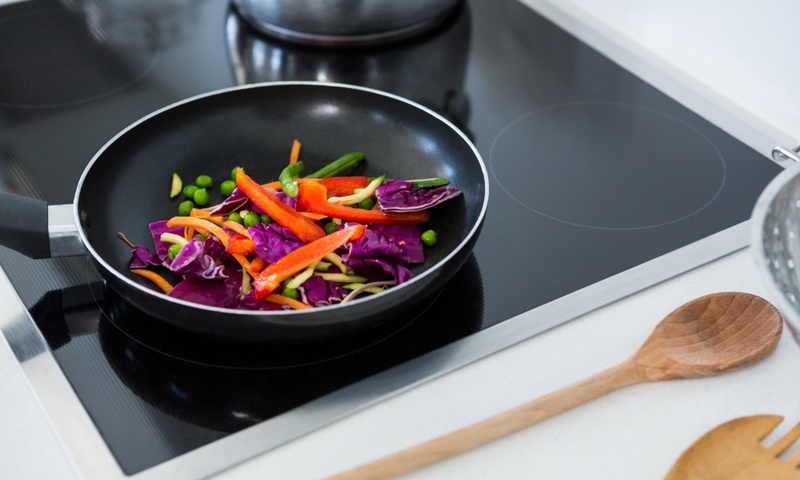 All of the induction products selected can also be used on gas, electric, and ceramic cooktops. Is there a difference between a skillet and a frying pan? What is the difference between a skillet and a sauté pan? How do I choose a frying pan/skillet? The All-Clad 4110 Stainless Steel Tri-Ply 10-inch Fry Pan is a high-quality, well-constructed frying pan that would be a great addition to your culinary collection. It can be used on gas, electric, ceramic, halogen and induction stovetops. This All-Clad frying pan review also applies to the 8, 12, and 14 inch pans and the set of 10 and 12 inch fry pans. The All-Clad 4110 Stainless Steel Fry Pan features a tri-ply construction with an inner core of aluminum sandwiched between two layers of stainless steel. The cooking surface is 18/10 stainless steel with a starburst finish. I called All-Clad customer service to inquire what is meant by “starburst” finish. They said it is part of the manufacturing process whereby the surface is finely sanded using mechanical means. There are no chemicals involved in the creation of this finish. The exterior layer is induction compatible stainless steel and is mirror polished. The inner core is pure aluminum, not just at the bottom, but all the way up the sides, thus providing even heat distribution. The aluminum is sealed between the two stainless steel layers preventing it from coming into contact with the food. If scratches appear or the pan is so worn that the aluminum is exposed, then it’s time to replace the pan. The flat bottom and sloped sides of this pan make turning foods with a spatula easy. 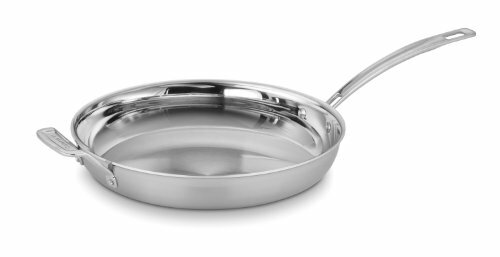 This All-Clad D3 fry pan has a 10.5” outer diameter and a 7” flat interior surface. This is a well-balanced pan and very easy to pick up with one hand (weighs 2 pounds). The solid stainless steel handle is securely attached to the pan with two stainless steel rivets. The contoured handle is just the right length and angled in such a way that it is very comfortable to hold. It stays cool except at the end closest to the pan (about an inch from the pan). This All-Clad stainless steel fry pan can be used to sear, brown and pan fry all kinds of food. If this pan is properly preheated, you can successfully cook eggs that don’t stick to the pan using only a small amount of butter. After preparing the eggs, the cleanup was easy (warm water and small amount of soap). Although All-Clad states this fry pan is dishwasher safe, some folks prefer to hand wash their stainless steel pans. The Cuisinart MCP22-30HN MultiClad Pro Stainless 12-Inch Skillet with Helper is a high-quality, well-designed piece of cookware that would be an asset to your culinary collection. This skillet, as with all Cuisinart MCP Stainless Steel products, can be used on gas, electric, glass ceramic, halogen and induction stovetops and in the oven. 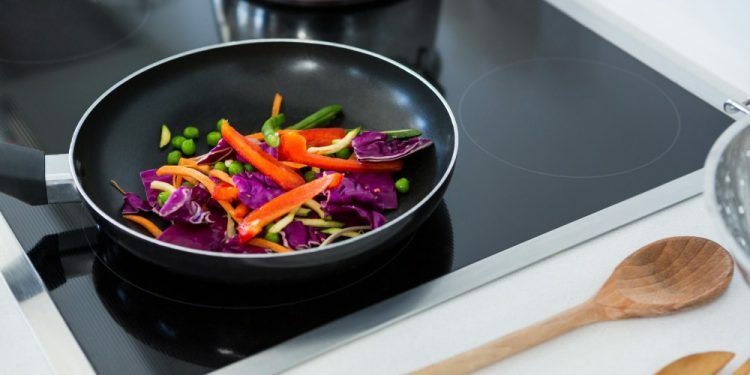 Given the growing popularity of induction cooktops, it is nice to have cookware that can be used on a variety of cooktops. Cuisinart also offers an 8 and a 10-inch MultiClad Pro Tri-ply skillet (they do not have handle helpers). The Cuisinart MultiClad Pro Stainless 12-Inch Skillet with Helper has a core of aluminum sandwiched between a smooth stainless steel interior and a brushed stainless exterior. These three layers run throughout the sides and bottom of the skillet providing even heat distribution. The aluminum layer does not come into contact with the food as it is completely sealed between the two stainless steel layers. Cusinart touts this skillet and the other cookware in their Multi-Clad Pro Line, as being constructed using Heat Surround™ Technology. In short, the food is evenly heated because it is surrounded by heat from the bottom and all around the sides of the cooking vessel. My limited experience with this skillet has been that food is evenly heated. Although this pan weighs approximately 3.65 pounds it seems heavy to me. However, with the helper handle it is manageable. The interior of the skillet is polished stainless steel while the outside is a brushed finish and the rim has a mirror finish. The cooking diameter of the pan is about 9.5 inches and the pan is approximately 2” deep. The sides of the skillet are sloped which provides a bit more surface area. This induction ready skillet features a long, cast stainless steel, Cool Grip™ handle. It is designed to stay cool to the touch and it does. The pan also has a helper handle. Both handles are very sturdy and have a thumb rest which makes holding the skillet more comfortable and easier to balance. The helper handle makes it a lot easier to lift the vessel to transfer the food to a plate or into the oven. The rim of the skillet is tapered making it easy to pour and not have the liquid drip down the side of the skillet. Some consumers have commented that the rim has sharp edges on various Cuisinart MCP-Pro products. However, I did not find that to be true of this skillet. Although Cuisinart says this skillet is dishwasher safe they qualify it by cautioning that it could be damaged in the dishwasher in various ways. They don’t outright say not to put it in the dishwasher. However, my reading is that hand washing with a non-lemon detergent is the preferred cleaning method. Cleaning the rivets accounts for most of the cleanup. Along with the skillet, Cuisinart provides a Use and Care Guide along with instructions explaining how to register your product. They offer a lifetime limited warranty on this skillet. Upon receiving your new skillet ensure that the bottom is flat, and there are no scratches or dents. Then place it on your cooktop and test it to make sure the skillet doesn’t rock. It is worth noting, if the customer decides to utilize this warranty, they are responsible for the cost of shipping the skillet to Cuisinart for repair or replacement. In addition, they require a check or money order to defray the return shipping costs (different warranty conditions apply to California residents). The warranty terms are detailed on their website, cuisinart.com. Note: I purchased this skillet and examined it thoroughly upon receipt. The box was well-packed and there were no scratches or dents and the bottom is flat. In 1971, Carl Sontheimer and his wife, Shirley formed Cuisinart. The company imported to the United States top-quality stainless steel cookware and in 1973 he and his wife designed and manufactured a food processor. They sold their company to a group of investors in 1988 who a year later, sold the company to Conair Corporation. Since then Conair expanded the Cuisinart line to include a wide variety of kitchen related products including the MultiClad Pro line. The Anolon Nouvelle Copper Hard-Anodized Nonstick Twin Pack 8-Inch and 10-Inch French Skillets are well-designed and durable pans. These pans do not have PFOA, lead or cadmium. The base has 5 layers of materials ensuring even heating. The handles are very comfortable and the rivets are flush with the pan surface making cleanup very easy. These skillets can be used with induction cooktops, electric, gas, glass ceramic and halogen stovetops. The Anolon Nouvelle Copper Hard-Anodized Nonstick 8-Inch and 10-Inch French Skillets have a metal base composed of five layers. The hard anodized aluminum cooking vessel is counted as one layer. 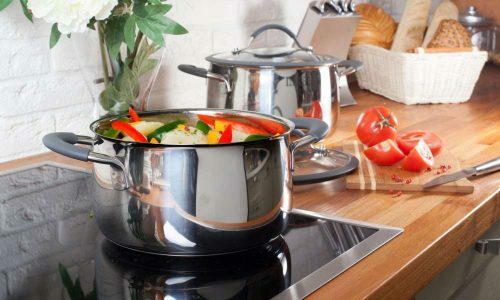 The other four layers from exterior to interior are: magnetized stainless steel cap (making it induction compatible), aluminum, copper, aluminum, and hard anodized aluminum cooking vessel. The interior and the slightly slanted sides of the pan are hard anodized aluminum. The 8 ½ inch skillet weighs 1.8 pounds and the 10-inch skillet weighs 2.65 pounds. The handles are made of cast stainless steel and are easy to grip and balance. The edges of the rim are smooth for safe cleaning. The aluminum rivets with nonstick coating that attach the handle to the pan are flush with the pan. This makes cleanup very easy since there are no bumps that trap food and grime while cooking or stirring. The side of the Anolon Nouvelle Copper box containing the two skillets states they are Made in Thailand. These Anolon non-stick skillets can be used on the cooktop and in the oven up to 500ºF (they are NOT broiler safe). Anolon states that metal utensils can be used. However, they also warn that scratches and peeling due to sharp-edged utensils are not covered under the warranty. Therefore, to be on the safe side, it is probably wise to use silicone, wood, or plastic utensils. One way to preserve the nonstick coating is not to use cooking sprays since the ingredients buildup on the surface of the pan. This causes the release system of the coating to stop performing as it should, and in time, food will begin to stick to the pan. Another suggestion to extend the longevity of the coating is to use low to medium heat as high heat may damage the nonstick coating. Damage due to the use of cooking sprays and overheating voids the warranty. These skillets are NOT dishwasher safe. However, this is not a problem as they are easily cleaned by hand washing them with a non-abrasive sponge such as Scotch-Brite Non-Scratch sponges and warm water. As with all nonstick cookware, never run cold water in the cooking vessel while it's hot, as the extreme temperature change will cause the coating to deteriorate. Note: The Use and Care Information and warranty papers are attached to the box. Anolon has a customer friendly warranty policy. If the consumer believes the item to be defective, they may submit the warranty request and photographs of the product to their website (Anolon.com/warranty). There is no need to provide proof of purchase or mail the product to Anolon. The pictures will then be evaluated, and a determination made as to whether or not they will replace the product. A written warranty is included with the skillets. It states it is a lifetime warranty. However, there are exclusions including but not limited to damage caused by accident, misuse, abuse etc. They specifically state that scratches, stains, discoloration or damage from overheating are not covered by the warranty. Meyer Corporation, U.S., founded in 1981, is one of the largest cookware marketers and distributors in the United States. Their headquarters are in Vallejo, CA with the distribution center located in Fairfield, CA. Product manufacturing takes place in China, Thailand, and Italy. Meyer Corporation’s most prominent brands are Circulon and Anolon. They also sell several licensed brands including Farberware, Paula Deen and Rachel Ray. The Ozeri Induction Fry Pan has a magnetized AISI 430 steel base plate (has ferromagnetic properties needed to be induction ready) and an aluminum core. The three coating layers are 100% free of APEO and PFOA, and the lesser known chemicals NMP and NEP. This pan heats evenly on a variety of cooking surfaces including gas, electric and induction, making it very versatile to use. There’s no need to use oil or soak this pan to clean it. Everything you cook will slide off easily, and a simple sponge will clean it all up. The handle is silicone coated enhancing its safety. The diameter of the base of the pan is about 9 inches. The magnetized layer of the pan seems to be a bit thin. This means that it might not work well for every type of induction top. Higher heat than expected may be needed when cooking with this frying pan. The skillet is one of the most used pans in residential and commercial kitchens. Our next review of induction ready frying pans/skillets is the Circulon Symmetry Hard-Anodized Nonstick 9 and 11 inch French Skillets (twinpack). 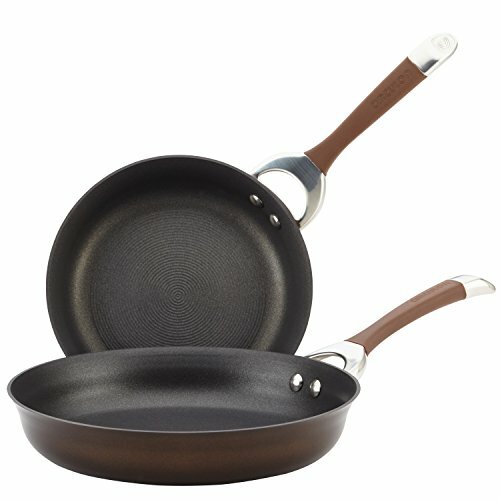 These non-stick pans work on all types of ranges including induction. They are durable, sturdy and well-constructed. Circulon pots and pans are manufactured by Meyer Corporation, the largest cookware distributor in the United States. Their headquarters are in Vallejo, CA while their parent company, Meyer Manufacturing Company, is based in Hong Kong. The Circulon Symmetry Hard-Anodized Nonstick French Skillet Twin Pack is composed of a magnetized stainless steel base, hard anodized aluminum and a three-layer non-stick coating. The impact-bonded stainless steel base is magnetized, making it induction compatible. The term “impact bonding” sounds more complicated that it really is. It just means a machine uses pressure and friction to bond the base of the pot or pan to a disc. In this case, the magnetized stainless steel is bonded to an aluminum disc. The aluminum is spread to the outside edges of the pan which keeps the corners of the pan’s interior from being burned. The hard anodized aluminum is part of the pan and not a coating. Two advantages of this cooking surface are that it is tough and therefore less prone to being scratched and is corrosion resistant. Meyer Corporation claims it is twice as hard as stainless steel. Another benefit is that heat is distributed evenly, thus eliminating hot spots. The handle of the induction skillet is cast stainless steel and has a rubber (silicone) covering. It is easy to balance, comfortable to hold and have a solid feel to them. Although the handle has a hole in it to hang on a hook, it is not completely open from front to back. The two rivets that attach the handle to the skillet appear to be silver screws. This is in contrast to the rivets on the Anolon Nouvelle Hard Anodized Fry Pans which are flush with the cooking surface and covered with nonstick coating. The interior of the Circulon Symmetry Hard-Anodized Nonstick French Skillet Twin Pack feature Circulon’s TOTAL® Nonstick System. The purpose of this system is to protect the cooking surface and keep food particles from sticking to the cookware. A nonstick coating is applied to the exterior as well. There are two components to this patented system. The first is the PFOA free Chemours Autograph™ nonstick coating. (Chemours states on their website the Circulon Symmetry line has Autograph™ nonstick coating.) This coating is PFTE based and does not contain lead or cadmium. Three separate layers of coatings are applied to the cooking surface. This coating system reduces the amount of food that sticks to the surface. 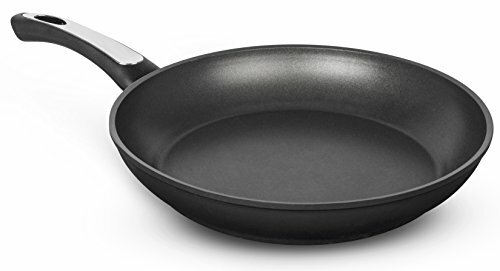 If you prefer induction ready frying pans that do not contain PFTE, the stainless steel pans reviewed above are an option as well as a cast iron skillet. The second component of the Total Non-Stick System is the hi-low groove design. The cooking surface has raised circles that are closely spaced with high and low areas that resemble grooves. One advantage of this design is that it reduces the tendency of food particles to stick in the valleys (low areas). Another is that while cooking or cleaning, the contact of implements or materials is likely to be with the peaks (high areas) of the grooves thus leaving the valley undamaged. The side of the Circulon Symmetry box containing the two skillets states they are Made in Thailand. These skillets can be used on the cooktop and in the oven up to 400ºF. They are not to be used in a broiler. Circulon states that metal utensils can be used. However, sharp-edged utensils such as fork and knives must not be used. Some cooks prefer wooden, bamboo or heat-resistant silicone utensils. Even though these skillets are dishwasher safe, Circulon recommends hand washing. Since they cleanup so easily with a light-duty nylon sponge, mild dish soap, and warm water there really isn’t any reason to put them in the dishwasher. Moreover, the warranty is not honored if there is damage from the use of an automatic dishwasher. When testing these skillets I was surprised that food did not get stuck in the grooves. The cleanup was as easy as it is with the induction friendly Anolon Nouvelle Copper frying pans which have a flat surface. Circulon states they back every product with a “Hassle-Free Lifetime Guarantee.” Two printed documents are attached to the box containing the 9 and 11 inch French skillets. One is the “Guarantee” and the other is “Important Safety, Use and Care information” (in English, French and Spanish). To file an online warranty claim, complete the form on the Circulon website and attach photographs of the defective product. 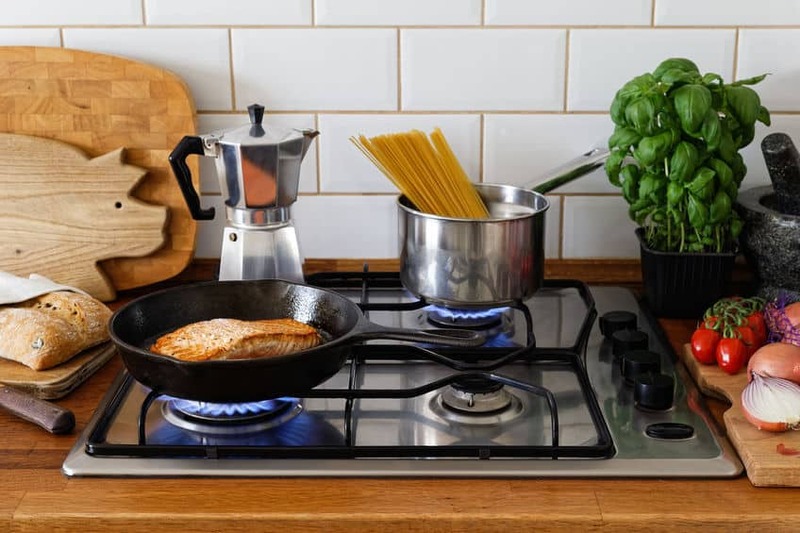 Examples of misuse that will void the product warranty are: overheating, oven misuse, use in a broiler, sharp metal utensil or appliance damage on nonstick product surfaces, using oven cleansers or scouring pads, and cleaning neglect. The Use and Care Guide further states that scratches and peeling due to sharp-edged utensils is not covered under warranty. Additionally, damage to the cookware coating stemming from high heat voids the warranty. Some consumers have written reviews stating Circulon replaced their defective or damaged cookware. However, others have complained their warranty claim was denied. The terms “skillet” and “frying pan” are generally used interchangeably because both cooking vessels have sloped sides and similar depths. The use seems to vary between manufacturers and individuals. The french skillet has a little bit more surface area than the frying pan and the sides are less slanted. 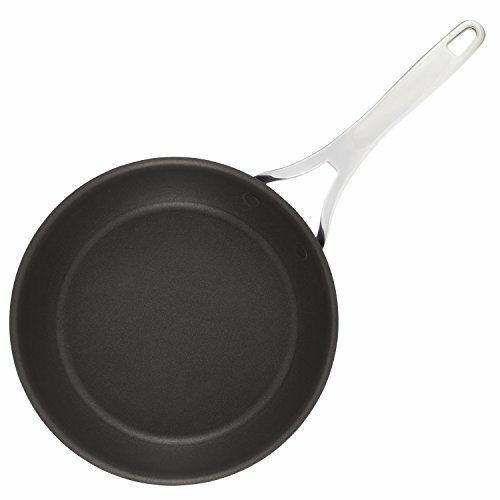 The shape of the pan distinguishes a skillet from a sauté pan. A skillet has short, sloped sides while a sauté pan has tall, vertical sides. Some sauté pans are tall with a narrow base and others have a low, wide base. 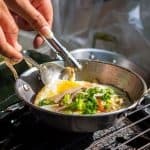 This article provides information about the advantages of both the skillet and sauté pan and when to use each one so you can decide which one is best for you. 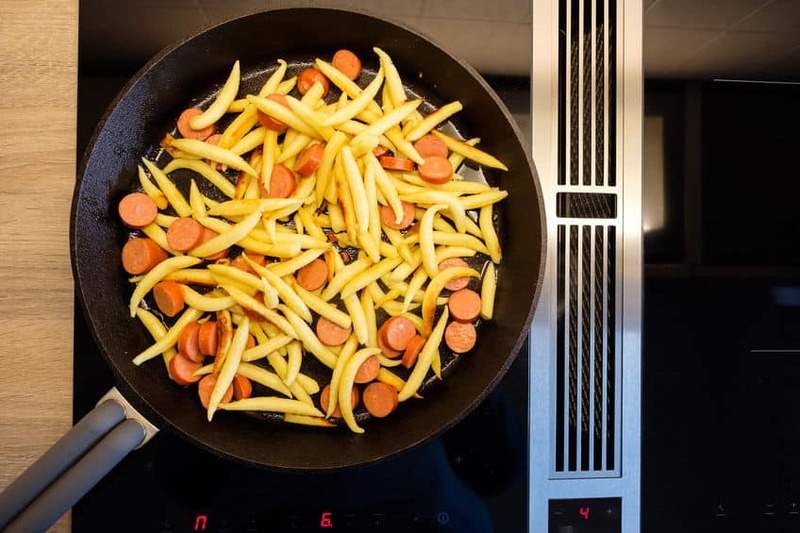 The initial step is to consider what dishes you are going to prepare in your new frying pan. Then you can decide whether you want a stainless steel, carbon steel, cast iron, hard anodized aluminum, or nonstick pan. The type of cooktop you are going to use, size and weight of the pan and budget are other considerations. We created a guide and a printable checklist for choosing the right frying pan to simplify the process.